Has anyone installed RPM's Wood Grain Console Wrap? I have not read (or even seen) anyone installing it. I thought it looked pretty cool (finishes off the interior, so you don't have that, one lonely piece of wood dash trim...but curious why it seems like everyone is doing Carbon Fiber or a Steel look? Ive looked at the various videos doing it and like the look. I’m just not sure if I have the patients or skill to really execute on it successfully. I like how the wood trim wrap lightens up the cabin. But I'm still waiting for my dual-motor Model 3. Please post some pics if/when you've it installed! I already vhave it on order and am just waiting for it in the mail. 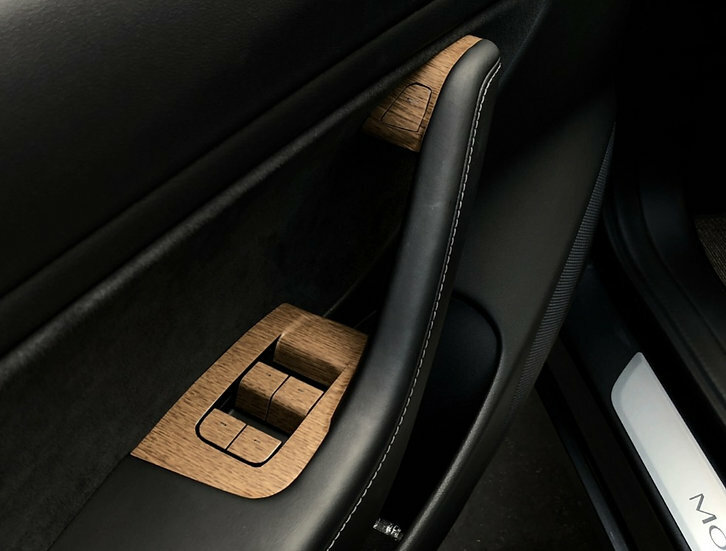 I think it will complement the existing wood trim, which seems incomplete in my opinion just by itself, and add a luxury feel to the car like the S/X. It really depends on the quality of the product of course and I will report back with it my findings by next week hopefully. I was at a shop that does ppf installs earlier this week. They had a model 3 in that had the rpm wood grain wrap installed. It looked really good. They said the owner had installed it. I should have snapped a picture, but didn't think about it. Exactly my thoughts when I see it too!! Never really liked the carbon fibre look and always love the wood look. I think it's more classy and luxurious. But not sure if it would be too much to cover the whole thing with wood? Initially, I thought of covering it all with wood but the piano gloss kinda grew on me.. But please post some pics! We'd love to see it! Get a nice close up too so we can see the grains and all.. I installed it 2 weeks ago. Fairly straightforward. Watch the video several times and take your time. The only trouble I had was with the cupholders. It was not possible to tuck the wrap under the one side of the trim. I also had a problem with the fit of that one piece. I emailed RPM Tesla and got an immediate reply. I have just received a replacement without charge. I will loosen the trim slightly. That will make the job easier. (The video on the site for running a USB cable shows how to easily remove the trim.) Take your time and use the soap/water spray generously. I will post a picture after finishing installation. Customer service was very good. I really hope somebody make a true wood matching veneer. You are correct. Please consider that this vinyl option is at a very good price point. When a true wood veneer comes along I will buy it. (and RPM will likely offer it). In the meantime this works really well. Keep in mind that most “wood” in cars and much furniture is vinyl or some other plastic. I am not defending RPM or their service lapses. I think they are growing too fast but are working to improve the quality of their products and customer service. I saw on this forum a M3 that was wrapped in a BLACK wood grain, and it looks FANTASTIC! If they are going carbon fiber moldings...a wood veneer would be very similar. Due to price point, I supposed I could start with a wrap...but how exactly how "easy" is this stuff to take off? Excellent question. I know RPM Tesla monitors this site. Perhaps they can respond? I'm also interested in the wood look and I'm hoping too see some more pics from anyone who has done it. Also wondering how close of a match it is to the wood on the dash, pictures are one thing but how does it look in person? I'm considering doing this but haven't ordered it yet. Would love to hear some actual feedback from anyone who has it. I'm sure @RPMTESLA doesn't have time to scour this entire site everyday but I will say I've always had excellent service from them and they've been very responsive when I've contacted them in the past. The color match on the product is pretty good. It is not quite as red as the dash. It is OK because of the distance from the dash. I would grade it a B minus. Grain match is a little closer. I installed the product a few weeks ago but removed it because of a defect described earlier in this thread. I will have the opportunity to re-install in about a week. I will post photos. Thanks for the reply, that is exactly what I was looking for. I was worried that the grain would look too different on the vinyl or give it a cheap appearance. If the color is not off that much then it should look great overall. Guess I'm going to be spending more money but I do love how easy it is to customize the look of this car. I also like the wood trim. It’s a nice contrast literally and figuratively (wood on a high tech car) and as I used carbon fiber to the extreme on my Model S I’m kind of bored with that look. Want something new and refreshing on the Model 3. 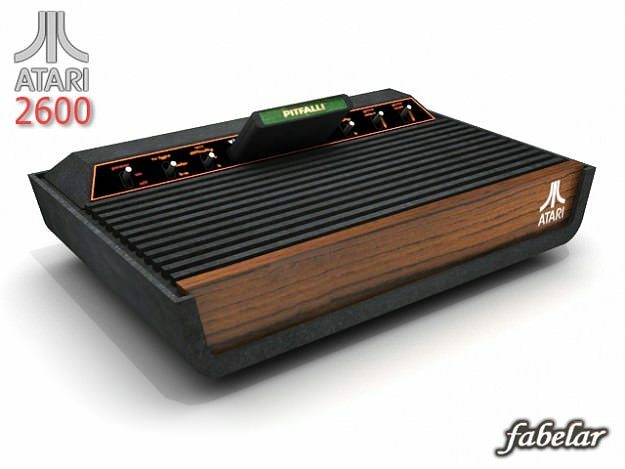 I’ll be doing something similar to the RPM mod but with real wood veneer, not a vinyl imitation. After all the dash is real ash wood veneer not vinyl. I already have the ash veener on hand (it has 3M sticky on the back side so it will be easy to apply to the center console) and I’m experimenting with stain to match the dash veneer color. I ordered the ash veneer from Rockler Woodworks — the grain matches the dash perfectly but the color is a bit light, thus the stain experimentation. 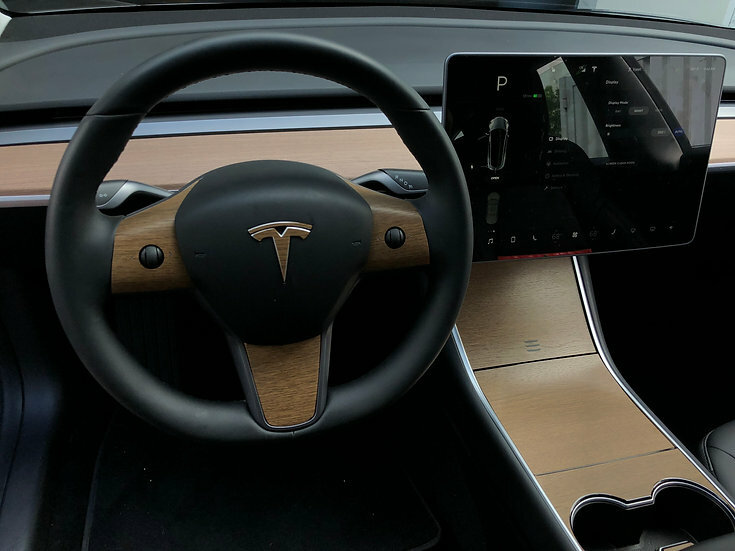 I’ve also ordered a spare Model 3 steering wheel and will have that modified with ash wood top and bottom and black leather on the sides. Also looking for other places in the interior to use the ash veneer. A vendor already sells such a steering wheel but it’s outrageously expensive and only has wood on the top side. I can have it custom made with ash top and bottom for half the price. Now all I need is the dual motor performance car . Delivery, Tesla tells me, will occur between August and October. So RPM just added "wood look" vinyl for the door switches and steering wheel...pretty much hate it haha but I'm sure we'll see a true wood veneer for the console soon enough. 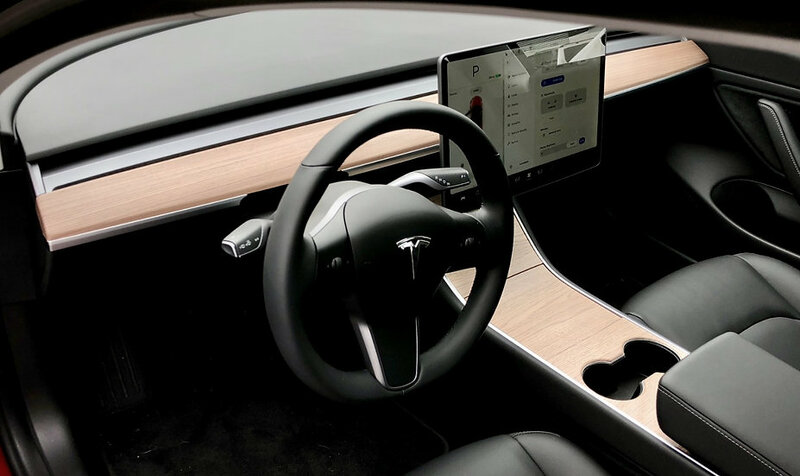 I see RPM sells the carbon fiber veneer for example for the Model S.
I understand RPM's need to sell more vinyl product but these latest examples of "wood" trim IMHO make no sense at all. Ask one question: where does it make sense to use wood or wood trim? Certainly not on switches or buttons in car. Even as a decorative touch it doesn't make much sense. And the Tesla logo on the steering wheel? Way over the top.